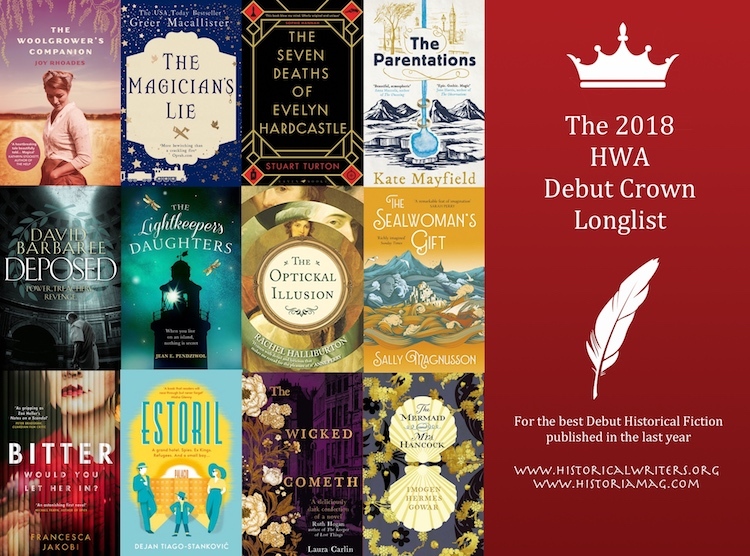 Thirty six remarkable books will fight it out in the race for the 2018 HWA Crowns, as the longlists are announced. 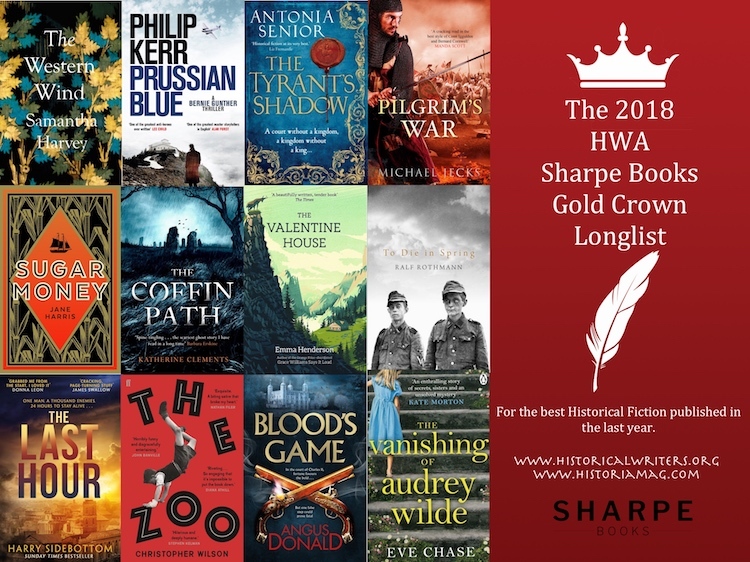 HWA Sharpe Books Gold Crown for best historical novel. Strikingly good writing, impeccable scene-setting, accomplished suspense and fantastic imagery. With a great cast of characters, this impeccably researched and highly entertaining novel is a terrific start to a new series. Original and beautifully written, this is a medieval detective story mixed with philosophy, featuring a fascinating protagonist and an immersive world. A vivid and gripping crime story that weaves in fascinating insights into its period. The penultimate instalment in a much-loved and admired series. Atmospheric, textured, engrossing and spooky, The Coffin Path is an intense and immersive read and a tremendous evocation of its period, with a hugely appealing protagonist at its heart. A relevant and important period of history brought vividly to life. Dark ironies mix with a moving personal story. A novel of real power, written with great style and empathy. 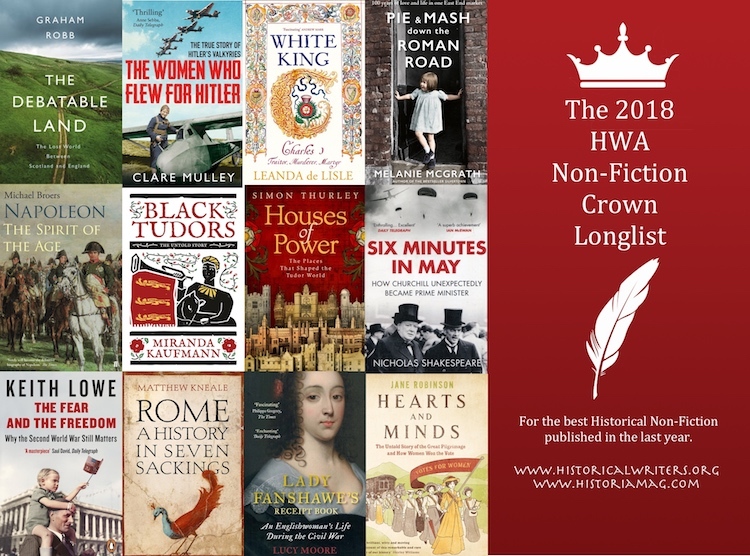 HWA Non Fiction Crown for best work of historical non-fiction. An important book, informed by brilliant original scholarship and research into the construction and function of royal Tudor palaces. It goes far beyond the confines of architectural history, though, to open up a new vista into the formal as well as the intimate world of the Tudor monarchy. A quietly revolutionary biography of a man obscured by layers of myth, prejudice and misunderstanding. Drawing on new sources, and interrogating familiar material in a new way, de Lisle emphasises Charles’s humanity, his weaknesses and his strengths, while restoring the women in his life to centre stage. This revisits the disastrous Norway campaign of 1940, our first engagement with Hitler’s war machine, to ask how the architect of the debacle nonetheless emerged as Britain’s wartime Prime Minister. As the action moves back from the frozen north to London political circles, Shakespeare draws on his novelistic background to provide gripping studies of the main protagonists, Halifax, Chamberlain and Churchill. The second of three volumes of what promises to be the best life of Napoleon Bonaparte yet written, it covers just five years – 1805 to 1810 – as an extraordinary run of military victories left the Emperor of the French master of the continent but more isolated politically and emotionally than ever before. The end result is a very human portrait of a brilliant but flawed individual, and one that showcases the author’s deep knowledge, elegant prose and compelling argument. Fast-paced, beautifully structured dual biography of Hanna Reitsch and Melitta von Stauffenberg, two ambitious women from very different backgrounds who defied convention to become pioneeringT test pilots in Second World War Germany. Reitsch remained a committed Nazi to the end; Stauffenberg supported the failed July Plot against Hitler’s life. Mulley tells the full story of these two distinctive women in gripping detail for the first time. Beautifully constructed and engagingly told Lady Fanshawe’s Receipt Book gives us the Civil War from the perspective of the domestic. Using Anne Fanshawe’s memoirs and her receipt book – a remarkable survival in itself– Lucy Moore plunges us into mid-seventeenth century Britain in this fascinating book. Kaufmann presents the reader with ten vivid true-life stories of black Britons revealing their lives and experiences while filing in some serious historical blanks in Tudor history. Hearts and Minds tells the story of the Great Pilgrimage: a six-week protest march in 1913. Robinson tells the stories of these remarkable women and the sacrifices they made skilfully weaving in the wider issues behind it and the extraordinary change these marchers helped to effect. Dodging all the cliches, McGrath does a remarkable job of excavating the lives of the owners, employees and customers of G. Kelly’s Pie and Mash Shop, to produce a fresh and constantly surprising portrait of working-class life in the East End over a century, from 1917 to 2017. A triumph of acute, empathetic but unsentimental observation, her crisp prose throws light on uncelebrated lives with thrilling forensic detail. HWA Debut Crown for best debut historical novel. A pitch-perfect Victorian sensation novel, jam packed with dark London streets, missing children, mysterious diaries and ghastly secrets, all elevated by the moving love story at its heart. A deliciously uncanny novel that wonderfully evokes eighteenth-century Iceland and Victorian London as it unspools a twisted tale of giants, mysterious earthquakes, centuries’ old sisters and the search for eternal life. Reading like the Man in the Iron Mask on the Tiber, this historical thriller sets your pulse racing, while brilliantly evoking the violence and intrigue of Ancient Rome. A rich cast of characters are thrown together by the discovery of what just might be a real mermaid, in this genuinely fresh take on eighteenth-century London, filled with powerful women, hapless businessmen and vivid set pieces. A psychologically penetrating portrait of a mother struggling to come to terms with her past, while trying to rebuild a broken relationship with her adult son. Jakobi convincingly reveals the complex ways in which exile and abandonment echo down the decades. A wonderful cat-and-mouse thriller set in a carnivalesque world of magicians and exotic dancers, in which nothing is quite what it seems. It’s thrilling opening sets the tone for a pacy and suspenseful read. For further information, please contact Lucy Santos, administrator for the Historical Writers’ Association at admin@historicalwriters.org.